How Do the Earplugs Work? From 2003 to 2015, Aearo Technologies Inc. and 3M Company supplied the United States military with dual-ended Combat Arms earplugs. Hearing loss and tinnitus are the most common causes of service-related disability among veterans, and these earplugs filled an urgent need. But design defects may have caused damage to the hairs and nerves of the inner ear in unsuspecting military personnel. 3M Company’s dual-ended Combat Arms earplugs were standard issue in certain branches of the United States military from 2003 until the company stopped producing them in 2015. Aearo Technologies Inc. created the earplugs, and 3M bought the company in 2008, according to a company press release. The dual-ended Combat Arms earplugs filled an immediate need for hearing protection for servicemen and women. Hearing loss, tinnitus and other hearing impairments are the most common service-connected disabilities for men and women in the armed forces, according to the U.S. Department of Veteran’s Affairs. More than 1.16 million veterans received disability compensation for hearing loss in 2017, and about 1.79 million received compensation for tinnitus, according to the Hearing Health Foundation. Hearing problems are the most common service-connected disabilities for men and women in the armed forces. Thousands of soldiers received dual-ended Combat Arms earplugs, especially those deployed to Iraq and Afghanistan in the early 2000s. But in 2016, a Moldex-Metric Inc. whistleblower lawsuit against 3M said the dual-ended Combat Arms earplugs were defective. The lawsuit accused 3M of fraud and said the company had sold the product to the military for more than a decade without informing the government of the defect. In 2018, the U.S. Department of Justice reached a $9.1 million settlement with 3M to resolve allegations that the company “knowingly sold the dual-ended Combat Arms Earplugs, Version 2 (CAEv2) to the United States military without disclosing defects that hampered the effectiveness of the hearing protection device,” according to a Justice Department press release. Now, hundreds of veterans have filed hearing loss and tinnitus lawsuits against 3M, according to Military Times. The dual-ended Combat Arms earplugs are non-linear, selective attenuation earplugs. 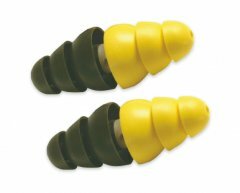 Unlike with most earplugs, Aearo designed these plugs to provide two options for sound reduction depending on how a soldier wears them. Wearing the plug with the olive-colored end in the ear — in the “closed” or “blocked” position — blocks all sound like a traditional earplug would. If a soldier wears the plug with the yellow end in the ear — in the “open” or “unblocked” position — the plugs block or significantly reduce loud noises such as battlefield explosions but still allow the wearer to hear spoken orders or approaching enemy combatants. When the earplugs became loose, it was difficult for the wearer or another person looking at the earplug to tell it was loose. Soldiers thought they were protected from dangerous levels of noise, but they were actually at risk for hearing loss and tinnitus. Who Used Combat Arms Earplugs? Aearo won an exclusive contract bid to supply the military with its dual-sided earplugs from 2003 to 2012. After 3M bought Aearo in 2008, it took over the contract and continued to supply ear protection to thousands of soldiers in the Army, Air Force, Navy and Marines. Moldex began selling its BattlePlugs in 2012 after winning the military contract from 3M, but 3M continued to produce its dual-ended Combat Arms earplugs until 2015. Combat operations, extended training periods, and more powerful noises from aircraft, vehicles and weapons systems continued to increase the risk of hearing loss in soldiers, according to a 2008 article by D. Scott McIlwain and colleagues in the American Journal of Public Health. It was a big problem for soldiers in the war in Iraq (Operation Iraqi Freedom) because of improvised explosives, rocket propelled grenades and mortar rounds. By the time the war in Afghanistan (Operation Enduring Freedom) started, Aearo had introduced the dual-ended Combat Arms earplug. In 2004, the military issued Combat Arms earplugs to all deploying soldiers. “The U.S. Marine Corps was so convinced of the effectiveness of the Combat Arms earplug that it ordered over 20,000 pairs, thereby temporarily depleting the entire national stock in 2003,” authors wrote. 3M supplied several military bases across the country. The company’s South Carolina plant supplied earplugs to several local bases that trained soldiers for wars in Iraq and Afghanistan, according to Moldex’s whistleblower complaint. These bases included: Shaw Air Force Base, the Marine Corp Recruiting Depot at Parris Island, the Naval Weapons Station Charleston and Fort Jackson. Hearing impairment — including hearing loss and tinnitus — remains the number one disability among veterans, according to the Military Health System. Noise exposure in the military can occur 24 hours a day. It can have profound effects on health and well-being. “Higher risks of anxiety, depression, and PTSD coupled with hearing impairment and noise-induced hearing injury (HINIHI) can have a compounded impact on [quality of life] among the military population compared to the effects on the civilian population,” researcher Hasanat Alamgir and colleagues wrote in Military Medical Research. High intensity or impulse noise most often causes the hearing loss. A large number of service members lost their hearing because of roadside bombs in Iraq and Afghanistan operations, according to researcher Timothy S. Wells and colleagues in Noise & Health. Seventy-one percent of these soldiers reported loud noise exposure and 15 percent reported tinnitus, or ringing in the ears. Hearing loss and tinnitus affect a soldier’s ability to perform his or her job, but they also affect mental health. In veterans with tinnitus, 72 percent had anxiety, 60 percent had depression and 58 percent had both conditions, according to the Hearing Health Foundation. For former Staff Sgt. Ryan Kelly of Austin, Texas, tinnitus is a constant reminder of the trauma he experienced on the battlefield near Baghdad in 2003. Unfortunately, service members often cannot control the noise they are exposed to. Hearing tests and protective gear such as earplugs remain the main preventative measures.